2 Blu-Ray Set with The Journey: Canelo/Rocky + Much More. Also: Sadam Ali vs. Mauricio Herrera, Tevin Farmer vs. Francisco Fonseca & Ryan Garcia vs Braulio Rodriguez. 2 Blu-Ray Set with 24/7 + Much More. Also: Jaime Munguia vs. Brandon Cook, David Lemieux vs. Gary "Spike" O'Sullivan & Roman "Chocolatito" Gonzalez vs. Moises Fuentes. 2 Blu-Ray Set with 24/7 + Much More. Also: Joseph Diaz Jr. vs. Jorge Lara, Diego De La Hoya vs. Randy Caballero & Ryan Martin vs. Francisco Rojo. 2 Blu-Ray Set with Road To Canelo-Chavez Jr.: A Fighting Tradition + Much More. Also: David Lemieux vs. Marcos Reyes, Lucas Matthysse vs. Emmanuel Taylor & Joseph Diaz vs. Manuel "Tino" Avila. 2 Blu-Ray Set with Road To Canelo-Smith + Much More. Also: Gabriel Rosado vs. Willie Monroe Jr., Joseph Diaz vs. Andrew Cancio & Diego De La Hoya vs. Orlando Del Valle. 2 Blu-Ray Set with 24/7 + Much More. Also: Takashi Miura vs. Francisco Vargas, Guillermo Rigondeaux vs. Drian Francisco & Jayson Velez vs. Ronny Rios. Includes 24/7 Kirkland - Angulo. 2 Blu-Ray Set with All-Access + Much More. Also: Abner Mares vs. Jonathan Oquendo, Francisco Vargas vs. Juan Manuel Lopez & Mauricio Herrera vs. Johan Perez..
Includes All-Access Canelo - Trout. Also: Omar Figueroa vs. Abner Cotto. Includes All Access: Canelo - Lopez. Also Marcos Maidana vs Jesus Soto Karass & Daniel Ponce De Leon vs Jhonny Gonzalez. Includes Jessie Vargas vs. Steve Forbes & Deandre Lattimore vs. Carlos Quintana. Includes Adrien Broner vs. Vincente Rodriguez & Gary Russell Jr. vs. Heriberto Ruiz. Includes Erik Morales vs Pablo Cesar Cano. Includes Adrien Broner vs. Jason Litzau. Includes Adrien Broner vs. Daniel Ponce De Leon. 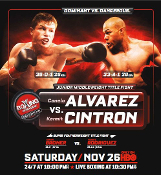 Includes Shane Mosley vs Sergio Mora, Victor Ortiz vs Vivian Harris, & Daniel Ponce De Leon vs Antonio Escalante.